Pergan Asuul is the principal antagonist during the events of Shadowkey. Although Skelos Undriel is worried that Jagar Tharn will come to control the Umbra' Keth it is Asuul who comes closest, and who is willing to sacrifice himself to strengthen the shadow. Although the non-linear nature of the game means it isn't guaranteed, his first appearance is supposed to be in Twilight Temple, where he describes your shadow as "practically marinated in courage", a taste he acquired some time ago. At this point, he will drop the Twilight Shadowkey when slain. 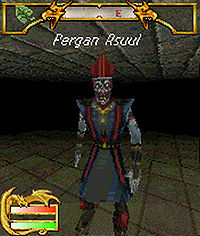 His second incarnation is found in Lakvan's Stronghold, despite Jagar Tharn's advice to Lakvan to end his association with Asuul. It is this incarnation that will eventually prove Asuul's undoing, as his slip of the tongue reveals either the location or identity of Azra Nightwielder and restores Azra's memory. 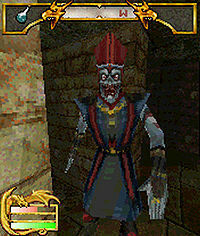 If the meeting in Twilight Temple has been avoided, Asuul has just one word to say before beginning combat: "die". Otherwise he will ask if you found slaying him to your liking, and tell you that you should take comfort in the fact that you are doing his will if you try to kill him again. In either case, his last words in this incarnation are "It is even better than I could have hoped for." before giving away the knowledge about Azra. His final incarnation stands at the top of the stairs leading to Crypt of Hearts III - the final stairs before the Umbra' Keth can be encountered. 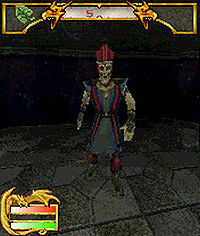 Trying to use the stairway reveals that Asuul has cursed them to prevent anybody descending; he must be killed before the final level can be accessed. This page was last modified on 5 July 2014, at 18:45.